Synthetic peptide within Human GABA A Receptor alpha 2/GABRA2 aa 384-414 (C terminal) conjugated to keyhole limpet haemocyanin. The exact sequence is proprietary. 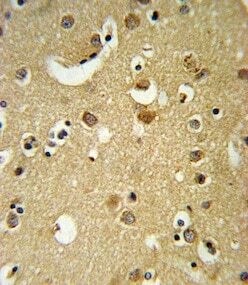 Human brain tissue; NCI-H460; MDA-MB435 cell lysates. Our Abpromise guarantee covers the use of ab176170 in the following tested applications. WB 1/1000. Predicted molecular weight: 51 kDa. Belongs to the ligand-gated ion channel (TC 1.A.9) family. Gamma-aminobutyric acid receptor (TC 1.A.9.5) subfamily. GABRA2 sub-subfamily. 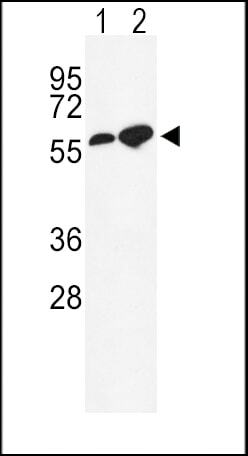 Immunohistochemical analysis of formalin-fixed, paraffin-embedded Human brain tissue labeling GABA A Receptor alpha 2/GABRA2 with ab176170 at 1/10 dilution. 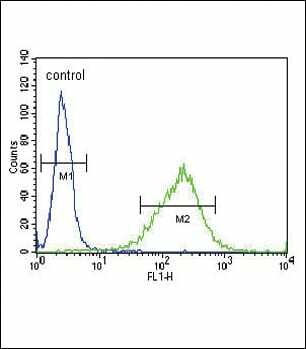 Flow cytometric analysis of NCI-H460 cells labelling GABA A Receptor alpha 2/GABRA2 using ab170176 (green) or negative control (blue). Publishing research using ab176170? Please let us know so that we can cite the reference in this datasheet. There are currently no Customer reviews or Questions for ab176170.